In this study, Emily Byrne Curtis explores as her subject lenses, spectacles, aventurine glass, and windows found in China from the sixteenth century. She traces their technological development back to the glassworks in Murano, Venice, and explores their significance in terms of Venice's commerce with China. Because glassware also figured among the gifts which three papal legates from the Vatican presented to the Kangxi and Yongzheng emperors, the author examines many documents from the archives in Rome and the Vatican; the study therefore touches, to an extent, on the history of the Catholic Church in China. Curtis also discusses in the volume some contemporary Chinese references and verses to European glassware, and in the case of enamel materials, she discloses the pronounced effect their use had upon the decor of Chinese porcelains. Contents: Introduction; Wonder and desire: the glass was most beautiful; New notions of seeing: mirrors and lenses; Panes of glass: windows and paintings; Diplomatic overtures: The daren (great personage) from the Vatican; Glass: 'pieces as beautiful as our aventurine'; Cristalli: 4 cases of precious glass; 'White gold': a magical substance; Enamel materials: a technological transfer; Carrying treasure to China: the Albion; Glossary; Bibliography; Index. 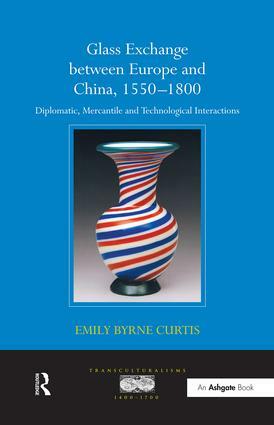 Emily Byrne Curtis is an independent scholar and author, whose essays on Chinese glass have appeared in the Palace Museum Journal, Beijing; Arts Asiatiques, Paris; Journal of Glass Studies, Corning, NY; and Transactions of the Oriental Ceramic Society, London. She is the author of Pure Brightness Shines Everywhere: The Glass of China (Ashgate, 2004).